Rather appropriate reading while living in Paris! I'm only a third of the way through the story. Can't wait to see the movie...it finally got to Paris a couple of weeks ago. Many American movies are shown with their original voice...or VO as they would list the movie here. 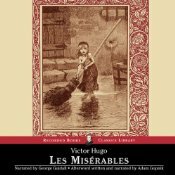 I can't imagine reading this book...there is a good reason why the title is, "The Miserable." I've learned a bit about French history through this story. The significance of Napoleon and his battle at Waterloo was discussed in great detail. There is also a lot of detail about areas of Paris that are very much a part of my world today. Ooops...good thing I haven't sewn the two sides on yet because the corner pieces are going the wrong way...bonding time with my seam ripper will be next. 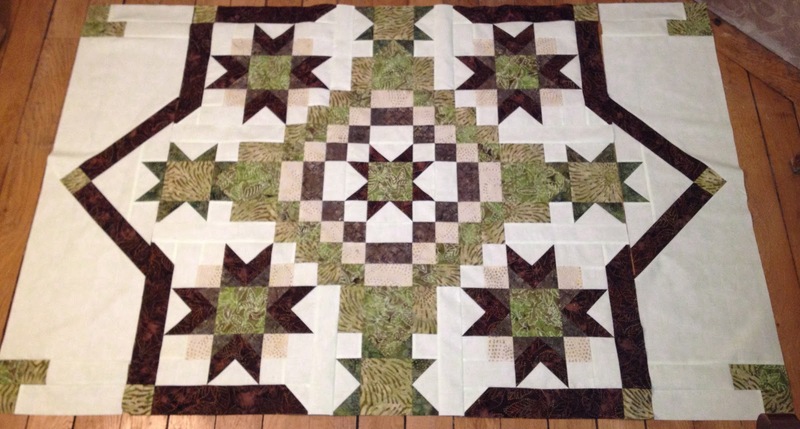 The corners of this quilt are supposed to be randomly placed, 2 1/2" squares. I'm not very good with random. So I tried out three different options. I am going with #2. 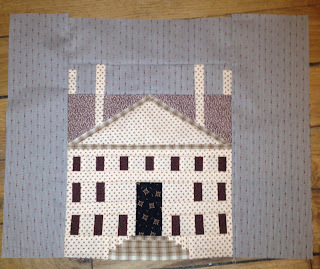 If you haven't guessed...the premise of the book is quilt patterns mostly using a 1/2 yard of six fabrics. 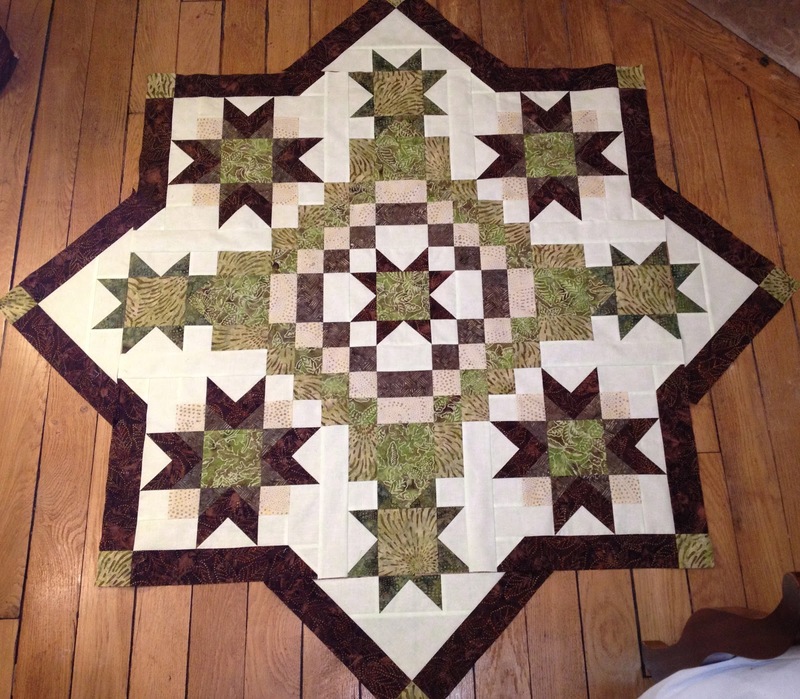 There are six other projects in the book, four quilts and patterns for pillows and placemats. My husband and I marvel at how quickly each day seems to pass. We are enjoying this experience so much! I can't believe how much I learn every day!!!!! This week we spent Monday through Thursday in French immersion classes for seven hours each day. We take the metro(subway) to our teacher's apartment on the outskirts of Paris in Clichy. The metro is very crowded to this location during our commuting hours, 9 a.m. and 5 p.m. One morning we had an especially tight fit to make it onto the train...I remember the doors brushing the backside of my body as I pushed forward into the mass of people already on the train. I made it! Smashed into strangers. We are quite fortunate to live in the heart of Paris and rarely have to experience tight fits on the trains for most of our regular travels around the city. I feel like we have had a greater taste of what most Parisians experience in their daily lives...more typical "big city life." Some parts are not so fun. A part of our lesson each day is to go out to lunch with one of our teachers...we are supposed to try and only speak in French...slowly...we are getting better at spending more time trying to converse in French. There are so many words that are exactly the same in French and English but our vowel pronunciations are very different. And they don't pronounce the last consonants most of the time...unless the next word starts with a vowel! So much to remember! Some days I am amazed at how much I have learned...other days I feel so frustrated! I can't make my mouth create the sounds I hear! The "R" sound is the biggest struggle....I feel like I need to have a much more sultry or earthy quality to my nasal American timbre. Friday and Saturday morning we met for only three hours of French. Friday afternoon we had our appointment to get the final step done for our visa to live in France. It was a typical, bureaucratic experience...hurry up and wait. But...we are officially sanctioned to live in Paris and that is a good thing. We thought spring was on its way but the cold and snow have returned to Paris. Darn! I am so anxious to see all of the gardens in bloom. There is not enough snow to stick but it feels so cold walking around ...even though we are Alaskans we are chilled! I think it is mainly because in Alaska we do a better job of layering up in the winter. I need my wool socks! I got some sewing done today...a nice treat. Of course my mind has started to think of changes to make to the pattern...but it is a kit! I think I can make one of my concepts work with the fabric I have left. I will try and figure that out today. 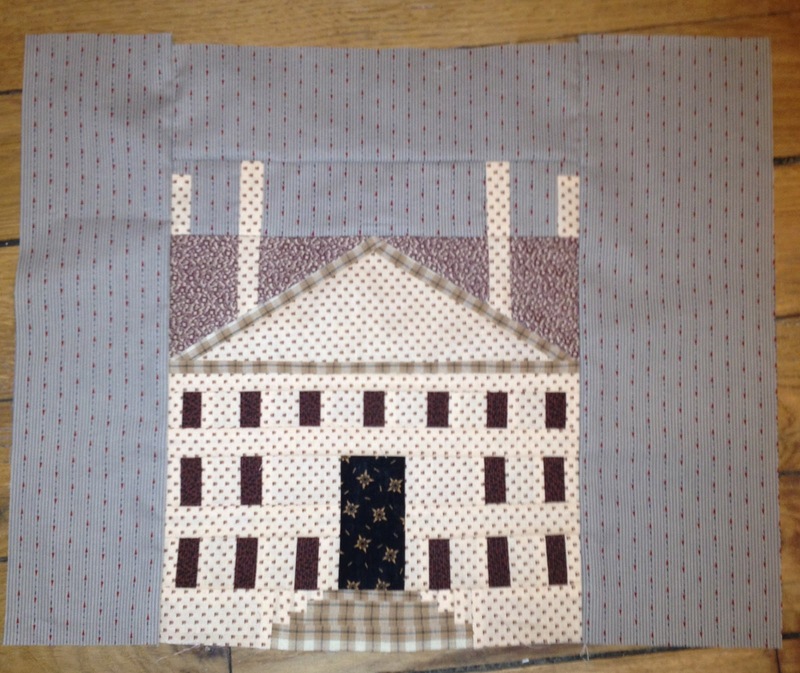 I ventured to a Needlework Exposition today...what a treat! 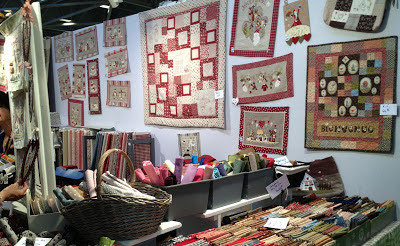 When I walked in it felt just like a mini Houston Quilt Show...vendor booths!!!! The show had a very small display of quilts and there was a smattering of quilt booths but it was more than I have seen in a while. There were a lot if embroidery and cross stitch booths....each one with it's own unique designs and lots of them. I didn't see any repeats. The same with the embroidery designs. The French definitely have their own little niche. Moda's line, French General looks like it was lifted from these booths. Most venders would not allow photos so I only took a few shots. 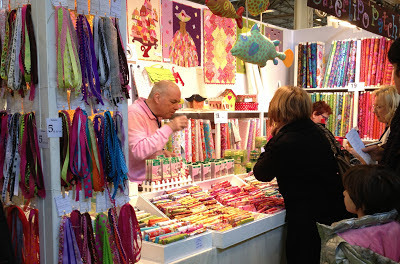 There were a few booths with Kaffe Fassett fabrics. Two tiny booths with batiks...and they weren't tempting. I came close to buying some cross stitch kits but in the end I bought nothing. It was all very expensive....and a little on the "cutesy" side...just not my style...but I was tempted. Lots of beautiful embroidery work...I was so impressed at how many original patterns there were. Most of the quilt patterns for sale resembled Anne Sutton's look with some patchwork mixed with embroidery...and sometimes they used wool appliqué. There were lots of beautiful flosses, hand dyed silk ribbons and an incredible selection of linen and aida cloth in gorgeous colors. There were also lots of buttons to embellish the embroidery. Adorable fimo clay ones that resembled "Just Another Button Compay's," designs. I came very close to buying some of those but too expensive to just hide them in a drawer! Wooden buttons in lots of intricately cut designs. They reminded me of embellishments used by scrapbookers. I did see a lot of the wooden buttons repeated in different embroidery designs...strictly for use on items used as wall hangings...not washable. It was a great little adventure today. Now I have to study my French. Next week will be another immersion week of 7 hours-a-day. We had a French lesson yesterday morning and we have another lesson today. Wednesday I went to the market and tried my French...apparently I had my "tense" for the verb wrong. I gave the locals a little chuckle. It certainly is a great way to learn! I have spent time bonding with my Bernina. 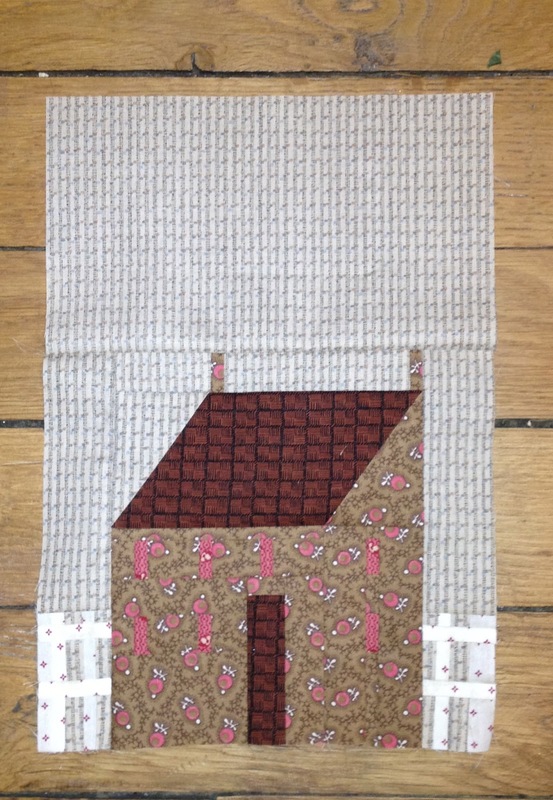 This kit is sew fun! I worked on another video yesterday...showing how to do hair on Dorothy for the "Christmas in Oz," stocking. It is tough to "self edit!" My first go at the video is much too long. 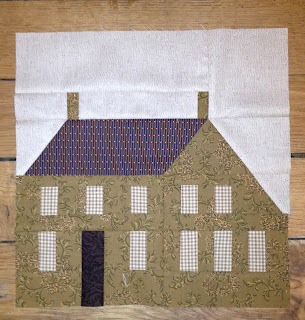 I got a great email from a quilter in Northern France letting me know there is an exposition of fiber arts that includes contemporary quilts...and the location is pretty darn close to our apartment. I'll probably go on Sunday. Hubby has suggested a trip to IKEA on Saturday. I jumped at the suggestion. Did you know they sell fabric there? And cute little sewing machines? The houses are constructed...just waiting for some "landscaping." I bought this kit at the Houston Quilt Show. It is going together very quickly...all green batiks. Love it! We had a very cold weekend in Paris. There was snow on the ground at Charles De Gaul Airport. Today is like spring...weather is ever-changing. I am so anxious to see all the gardens around here in bloom. 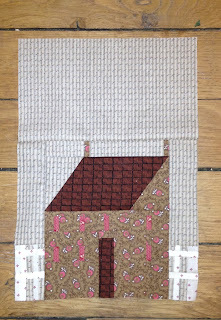 I have finished another house....only one left! As I work on these houses I keep imagining them in batik...with pretty blue skies. 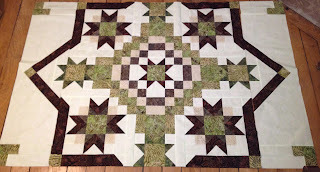 The homespun plaids are not good with foundation piecing...it would look so much better appliquéd but too late now! Here is my confession. I bought this kit on Ebay many years ago for $24...everything included. I can "afford," to make mistakes...and of course it will look lovely in the end. I also finished a cross-stitched ornament. Love Santa's quilt. Our French lessons are progressing slowly. We are going to need another two weeks of immersion-type lessons. About the time we are able to speak conversationally in French, I will be heading back to Alaska for a few months. 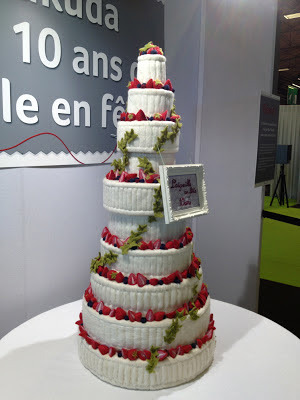 I sure have enjoyed my two weeks of intense sewing...now I have a week of intense French lessons starting tomorrow. I probably won't get much of anything else done. 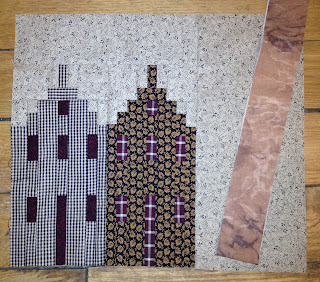 I have finished two more houses for the, "Quilted Village," quilt. Sturdy Brick and Apartment House. I finished the top of the "Woodland Holidays," stocking. I don't have the additional fabric on hand just yet to line and complete the stocking. Time to pick out another stocking to start working on...I'm going with "Santa's Catnap." I'm still working on the "Christmas in Oz," stocking. I want to video making Dorothy's hair but just haven't found time yet. I'll be linking up with Kathy's Slow Stitching Sunday to see what other handwork folks have accomplished. 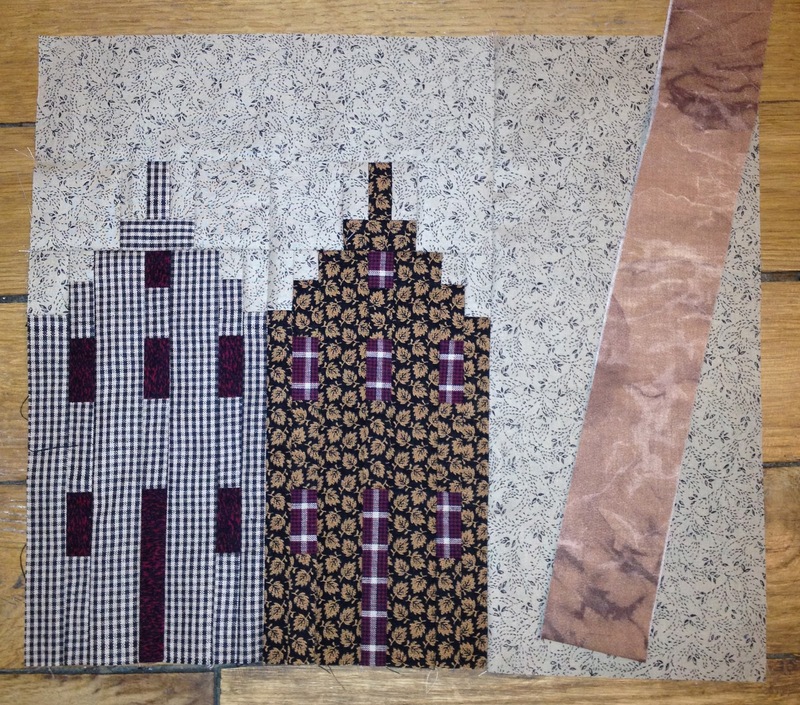 I don't like the fabric for the Dutch duplexes either...and the brown strip is supposed to be used for appliquéing a tree trunk and branches...I'm going to try and use something else from the scraps of other kits. Town Hall. The kit does include a pre-printed fabric flag to appliqué on a pole...it could look nice in the end. Saltbox...I actually like this one. Yesterday was Market Day. I spied a booth with French quilts for sale.